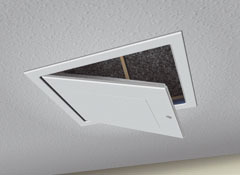 Not all existing hatches cope with a loft ladder, or may be in an awkward position. You may struggle each year to store items such as suitcases. The solution is simple. We can move or enlarge your existing hatch with little fuss or mess. This door and frame is stylish yet unobtrusive, and is ideally suited to the modern home. It has been designed to fit in with almost all house decor styles. With a lightly textured white finish, the door can be easily cleaned with a solvent free damp cloth. If you have a plastic hatch already but it does not have a swing down door, then this product is an ideal replacement, which will then enable you to have a loft ladder fitted. The door has a twist action, 3-point closing system allowing draught seals to create a close seal between your loft and living area. As standard, the door has 50mm of insulation. The door may be hinged to swing down, or to be removed from the frame completely for unobstructed access into your loft space. The hatch can be easily operated with the loft ladder pole. 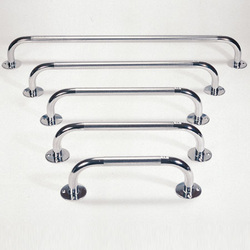 Grab rails are also a great option to add to your loft installation, giving you greater confidence and safety when entering or leaving your loft. We have two sizes of rail - large or small - and these can be placed to give you the greatest help accessing your loft space as safely as possible.